OCTANS NANO is the smallest and most adept state-of-the-art 4 000 m depth rated attitude and heading referencesystem (AHRS). It is built on iXBlue’s renowned fiber-optic gyroscope (FOG) technology and offshore instrumentationexpertise. 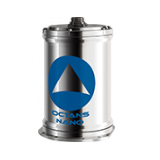 OCTANS NANO offers an outstanding price/performance solution, with rugged titanium housing, meeting themost challenging requirements of subsea applications.